Since 1998, Oklahoma Gold has been providing the most innovative, creative children’s birthday parties in the known universe! 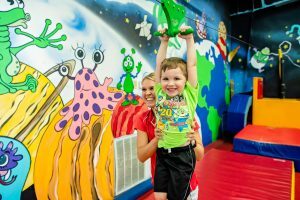 Your birthday child and friends can enjoy 90 minutes of bouncing, zipping and flipping fun in one of our two gyms. Tumbletown is for children 4 years old and under, and the Big Gym is for children 5 years old and older. All you have to do is bring the refreshments and let our trained staff supervise gym play, assist with the cake and write down every gift your child receives so that writing thank you’s is a breeze. All parties are private and are held on Saturdays and Sundays. Party pricing is $195 for 10 kids, including the birthday child, and $10 for each child after the first 10. Each participant must have a guardian-signed participation waiver. We will have extra waivers on site if needed. Parents are not allowed on the equipment but can enjoy watching the fun from the party room. Spots fill up fast, so make sure to reserve your birthday party at least one month in advance! All reservations require a $95 nonrefundable, nontransferable reservation deposit. What if I need to increase the number of kids attending my party? The week before your party, the birthday party coordinator will contact you to confirm the number of kids so that your party will be staffed accordingly. If you are expecting more guests than you registered when booking your party, you can let the birthday party coordinator know when they reach out. If you are expecting more or fewer guests than you confirmed with the birthday party coordinator the week of, please let us know. Our office number is 341-1175. When can I arrive to set up for my party? There are 30 minutes in between parties. You can arrive 15 minutes prior to your party time starting to begin setting up. Who counts in the number of children that I will pay for? Only children that will play in the gym will count toward the payment you will make after the party. What can I bring to the party? You can bring pretty much anything you want: decorations, food, beverages and party favors. We will have two standard rectangle tables and chairs set up for birthday cake and other food. Please do not bring alcohol into the facility. Do we have to open presents? If you would prefer more play time, you can forgo opening presents to have more time to play. Just let your coach know before the party that you would like to skip opening presents. Yes, you can request a coach when you book your party. If you’ve already booked your party, you can let the birthday party coordinator know the week of your party. The birthday party coordinator will contact you the week of your party to confirm numbers and answer any final questions. What if some of the children at the party are too young/old for the gym we booked? We are flexible about allowing children of all ages at your party in the gym you selected. However, there may be some restrictions for older children in the Little Gym. Because that gym was built for the little ones, there may be some weight restrictions on some of the apparatuses for children over 60 pounds. If there are younger children in the Big Gym, a parent may need to stay with them to ensure their safety at the party. If that is the case, the parent will need to sign a waiver provided at the party. Check with your coach before your party if you have any questions, and they will be happy to work with you. Can I get my $95 deposit back if I need to cancel? The $95 deposit is nonrefundable and nontransferable.